Sadhana simply defined is the technique of disciplining yourself. It is a practice, particularly when performed during the Amrit Vela, which resets your cycles and patterns to the rhythm of your ultimate aims, your Soul and the heartbeat of the Universe. It is this time of each day when the "veil" of the ego (limited self) is thinnest and so we can mindfully observe all the negative habits that lead you away from health, physical stamina, wholeness and higher consciousness and neutralize the desires underlying those habits one by one. Sadhana is a conscious activity to access the unlimited potential of your life through relating to and embracing the most mysterious aspects of our deep self - encountering the Knowable UnKnown and the UnKnowable Unknown. It is during the Amrit Vela, the 2 1/2 hours before sunrise, that prana concentrates and cleansing on all levels is more easily accomplished. Simply being aware, vertical and leaning in the right direction at this time has profound effects as the subconscious, which is usually tucked away and suppressed through tensions in the physical body, is right there on the surface and in our conscious awareness. For the Buddhist, Hindu and for many other spiritual traditions the Amrit Vela is the acknowledged time for deep spiritual practice if you're privy to the monastic approach. The Amrit Vela, the Nectar Time 2½ hours before dawn, when the world is transitioning and deeply still. It is a time when many souls are born or leave their bodies. From 2am - 6am is the most Satvic time, not being pulled by the Tamasic guna or the pushed by the Rajasic guna. There is no better opportunity to overcome inertia and practice stillness. Also, certainly if one is to attempt Brahmacharya this is the one time when one can surely open all the channels so that the sexual energy can flow freely and nourish the whole BEING, and not simply move along the usual passages creating that familiar "itchiness". Depend on the cosmic energy as a beloved depends on the fragrance of a lover. "It is common to regret not waking, but no one ever regrets coming to Sadhana!" A Sadhana practice, however, can be done at any time with varying results. A Sadhana can be a few minutes of meditation when you wake in the morning, it can be a yoga class you attend, or it can be any spiritual practice. A Group Sadhana is, unfortunately, a very rare blessing. Many locations simply don't have a enough practitioners to comprise a group. At Guru Ram Das Ashram and Baba Siri Chand Yoga center we have a Group Sadhana every day of the week! Everyone is welcome to attend Group Sadhana: Come for any or for all of it! There is no fee. 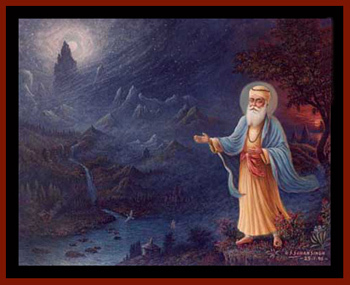 Japji: Morning Prayer - Recite or listen along with this prayer that is read aloud in Gurmukhi. Japji is called the "song of the soul" and celebrates connection to the Infinite. Meditation and Chanting - A specific sequence of chants is done as part of Sadhana. Ending Prayer - Our Group Sadhana is occasionally followed by Gurdwara (Sikh devotional service) that includes a "random" reading from Sikh scriptures (Guru Granth) and devotional singing. Everyone is welcome to stay and attend. It is not uncommon to seek answers of baffling questions by opening the Divine Book at "random". And as the Guru Granth itself claims, the pure of heart will find their queries replied. "Sadhana is a test of self-grit. If your sadhana is more important than your neurosis, you are fine. If your neurosis is more important than your sadhana you are not. Doesn't matter how saintly you are, nobody wants to get up in the ambrosial hours. Why you still do it is a mystery. At that time, between 3 and 6 o'clock, the rays of the sun pass at 60 degrees and you want to feel relaxed. You take a cold shower, wake-up and meditate. Why do you repeat the mantra hundreds of times? To create a stamina, an absolute mental stamina. Without that there is no chance for life to be smooth. If somebody refuses to exercise, nobody can force him, but at that one moment in life when that person needs physical stamina, it won't be there. Sadhana is what your mental stamina requires. Love is what your spiritual stamina requires " --YB 1/22/91. Answer: The greatest reward of doing sadhana is that the person becomes incapable of being defeated. Sadhana is a self-victory, and it is a victory over time and space. Getting up is a victory over time, and doing it is a victory over space. That is what sad­hana is. And when you do a sadhana in the sangat, you enrich yourself in multiple ways. First, the isolation which can hit anybody and make them go totally crazy is defeated. Secondly, when all of you meditate on God, the total effect of your sadhana becomes multiplied by the number of people participating. Sadhana is not a matter of advantages and disadvantages. It is simply a means through which you can defeat all your miseries, misfortunes, and handicaps. It is a very personal thing which does not relate to anybody except yourself. You are supposed to go through self-evaluation every day. That is what sadhana is. On one side is God, the superiority of you; on one side is you; and on one side is the devil or the inferiority of you. Between the three you have to assess yourself. 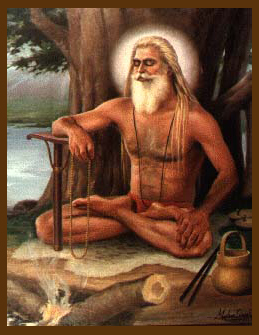 A sadhu is a being who has disciplined himself. Sadhana is the technique to discipline yourself. It is a scientific way to live. Answer: There is nothing to find out. Just go through it. Whenever you have a problem with sadhana, luck is smiling on you. That is what you have been waiting for. There is a chal­lenge-you can challenge it, and go through it. Answer: Challenge it by doing it. Sadhana gives fearlessness and a sense of self, as well as projection, polarity combination, equi­librium, respectability, totality, internal and external self-knowl­edge, purity, dignity, divinity, and grace. In addition, it gives you radiance, pranic and auric shakti. Finally, it gives you the quality of metal which is ever shining. You become a shining, living grace. This quality is embodied in loh-iron-which can absorb all the heat. Sarab loh means that which absorbs the entire heat and cold of all the universe, and still remains neutral. That is what sadhana gives you. When you want to be bountiful, do sadhana. Answer: One part of the sadhana should stay constant long enough for you to master, or at least experience, the changes evoked by a single technique. Each kriya and mantra has its individual effects, although they all elevate you toward a cosmic consciousness. Learn to value the pricelessness of one kriya, and all others will be understood in a clearer light. There is a natural 40-day rhythm to habits in the body and mind. It takes about 40 days of consistent practice to break a habit. It takes about 90 days to establish a new habit in action and in the subconscious. It is good to take these biorhythms into account when designing your practice. Answer: No. God should wake him. The experience of sadhana is between the individual and God. Do not interfere. You can inspire beforehand. If sleeping is a chronic habit, discuss it with the person at a convenient time, but do not abruptly wake someone. He may be at a different level of experience than you think. It is our intention, of course, to stay alert and awake during sadhana. If you are leading the sadhana, you can lead exercises which can stimulate the brain and supply blood to the brain to help people to stay awake. Sadhana is to bring physical and mental awareness. Some people pretend to be tired. They are not fortunate enough to catch up with that gap. But it is very unfortunate on the spiritu­al path when, instead of inspiring people, we start criticizing them. That is projecting your hatred. I feel that in the morning when you go for sadhana, you are going to be sadhus. What does it matter if somebody just gets up to say, "hmmmmmm?" That person is still doing something. At least he is not sleeping. It is far better than a person who is snoring at home in bed. Do you understand? Sadhana is a will­ful effort to prove you are not lazy about your own Infinity. When the sun rises early in the day, even idiots rise. But blessed are those who rise before the sun and prove that they are the chil­dren of the Almighty. Does it sound clear to you? Those who have guts will open the gates of the heart at 3:30 am. Answer: As a leader, your responsibility is to set a good example and to give clear instructions for each step of the sadhana. You should do as many exercises as you can without becoming unaware of the group. You must check to make sure that every­one understands the exercise before beginning yourself. Sometimes it will be better not to participate at all. Always join in during chanting, though. When teaching a class outside of sad­hana, you should participate as little as possible in the physical exercise. Concentrate only on inspiring and serving the students. Question: Is it mandatory for the same person to lead sad­hana every morning? 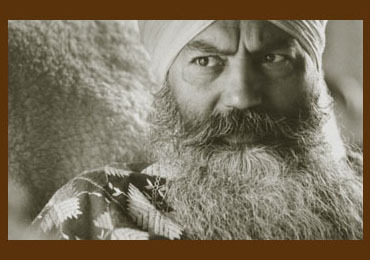 Answer: In all Kundalini Yoga sadhanas, the same teacher teach­es every sadhana - Guru Ram Das. Anyone who is qualified to teach can lead a good Sadhana. It can be very beneficial for the group to experience the effects of slightly different styles of lead­ership. Answer: Chant at a constant, mid-range pitch as much as possi­ble. If your breath rhythm is not correct, your spine is not kept straight, or you do not take complete breaths in the Adi Shakti Mantra, the chant will lose energy and drop in pitch. If you proj­ect the sound of the mantra from the back of the mouth in a full and roundish way, the power of the chant will increase as you continue, and the pitch will stay constant. If you are constant and listen to the sound of your chant, you will hear different pitches. These are actually overtones of the basic sound you are creating. The overtones will be high-pitched, subtle, and seem to float around the room. You cannot identify that tone with one person since it is formed by the combination of group sounds. The overtone is a good sign that the sadhana group is tuned in to each other and beyond each other. As you listen to the first overtone and become very calm, you may begin to hear higher and more subtle overtones. This awareness aids meditation on the etheric echo of your chanting, as you sit silent­ly after chanting aloud. Answer: If you are going to be in bed all day with an extreme sickness, then no. If it is not extreme (this includes most men­strual periods), then attend sadhana and do what you can. If you cannot exercise or meditate well, then at least attempt to medi­tate. Afterwards, lie down and rest in sadhana while mentally lis­tening to the shabd. This way you will get well faster, and maintain the rhythm of a regular sadhana. It also eliminates the tendency to have minor morning illnesses to escape the self-disci­pline of a constant sadhana. In other words, participation in a group effort and regularity of discipline are paramount. But do not be a fanatic to the point of aggravating a serious illness. Answer: Right after sadhana is a time to do anything - even have ice cream. Once right after saadhanaa I ate pizza--double cheese and triple mushrooms, and I ate it all and never gave any to anybody. I still worry about it, but I did it. Right after saadhana do whatever you want. Saadhana is saadhanaa. Right after saadhanaa it is your day. What is God's, give to God through saadhanaa. Take what you take during the day, but remember, when you have to go to God, the next day you should go with a clear heart and clean face. Naanak te mukh oojale. Mukh oojale--mukh means face, oojale means radiant. (The Oriental Woman, KWTC VI, 1981, pp. 90-91) .